The winner? Clip art! You don’t like to see “designs” like these popping up in church materials. They’re funny on the Internet, but things get serious when they make their way into real life. Just behind clip art are Comic Sans and Papyrus–the favorite fonts of churches across the country. But really, there’s nothing funny about Comic Sans. Plus, Jesus hates Papyrus. Beyond that, 11% of you are tired of churches ripping off art. They’re copying music or designs or anything they can get their paws on, and they’re not following copyright law at all. Another 11% of you are tired of churches messing up the music lyrics. There are only a handful of words up there, they ought to be able to get them right. 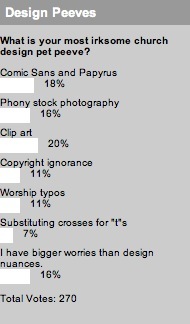 Finally, 16% of you are above all of these pet peeves, and you have bigger things to worry about. Bummer, design pet peeves sure are a lot of fun. This week, we’re looking to hear: What aspect of your church building would you most like to give an extreme church makeover? I understand the potential to misrepresent – but I’d rather fault on the inclusive side of this scale. Oh how I loved that quote. But anyway, Josh – thank for these results. They are very helpful. Perhaps I’m not a real critique as some people, but this helps for future projects. Hey Josh, thanks for the link. You know all these choices come down to why Jesus Hates Papyrus : mediocrity. Too often we look for the quick and cheap solution, especially when we talk about creative. Instead let’s create things that are red hot and show our passion not just for great creative, but for the story we are telling and for the God we serve.